Stevie Awards president Michael Gallagher visited Seoul, South Korea the week of December 2 (see related stories in the December 5 issue of Stevie Awards Update). He was the interview subject on the daily half-hour program "After 10" on English-language Arirang TV on Thursday, December 5. 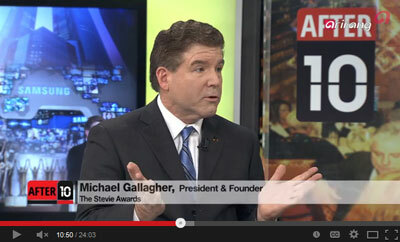 Gallagher spoke about the Stevie Awards in general, about the new Asia-Pacific Stevie Awards, and about the global competitiveness and reputation of Korean companies.